Way to take the saddest episode of any show in the history of television and turn it into an upbeat, colorful T-shirt. If you’re a fan of Futurama, you know what I’m talking about. Writers take note: don’t ever do that to a dog. Mostly just because it’s already been done now. I’m sorry, writers, I’m giving you bad advice. Your job is to make people feel things. And this episode does that. 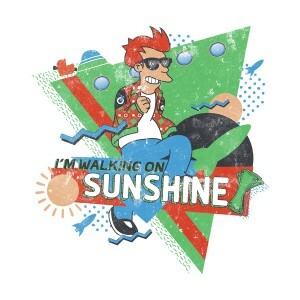 Keep walkin’ on sunshine, Fry.